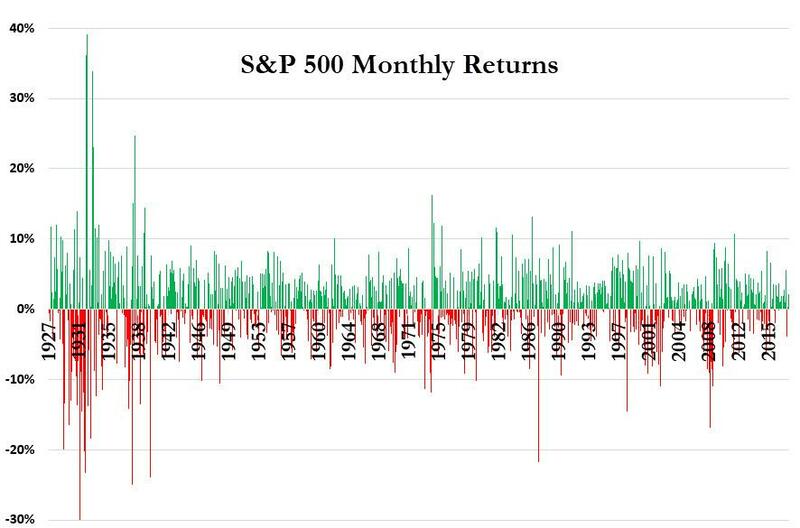 "Too Quiet, Too Long" - Paulsen Warns "Don't Expect A Fun Ending"
It is no surprise to anyone just how quietly exuberant US equity markets have been over the last few years as every dip was bought and every new high a sign to invest more cash, because "the Fed has your back." But, just how quiet is quite surprising and Jim Paulsen of Leuthold Group asks whether it's been "too quiet, too long?" With small moves in prices comes the possibility that investors are too complacent, he writes. 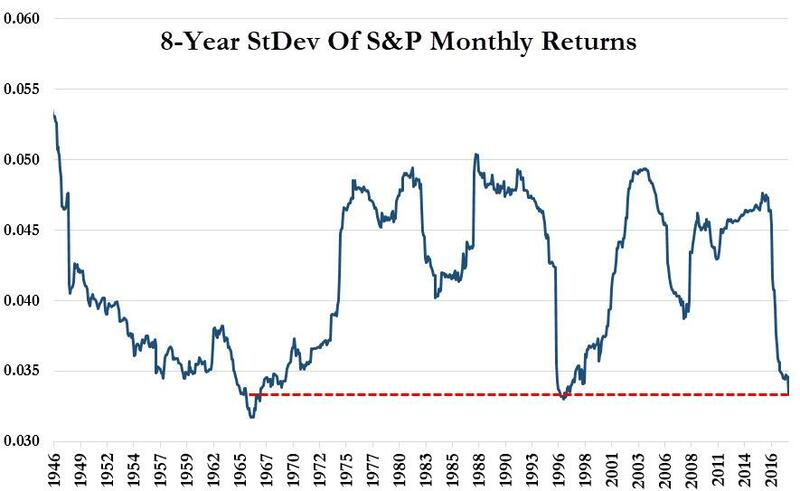 Current conditions - as measured by trailing eight-year annualized standard deviation of monthly S&P 500 percentage moves - are similar to 1997 before the dot-com implosion, Asian crisis and Russian debacle. After the 1966 signal, the S&P fell 22% (and even more in 1969 and 1970). After the 1997 signal, 1998 had some big drawdowns before hitting the record highs and crashing in 2000. While he's not predicting an imminent collapse, he is careful to warn investors that "past periods as stable as the last eight years didn’t have fun endings" is something to "noodle over during the dog days of summer." And speaking of "noodling" - Gluskin Sheff's David Rosenberg has been asking some uncomfortable questions recently. 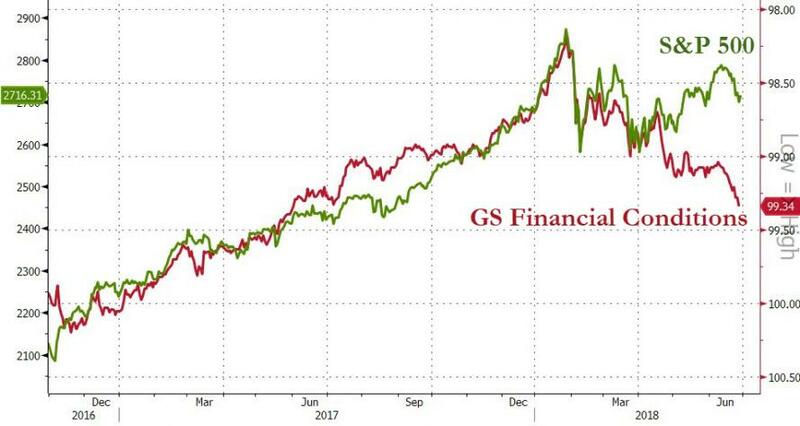 How can any equity bull seriously look you in the eye and smile when Financials get hammered 1.3% as they did yesterday, and are in official 'correction' terrain? How does that comport with a bullish narrative, ever, considering that Financials are the lifeblood for the economy? 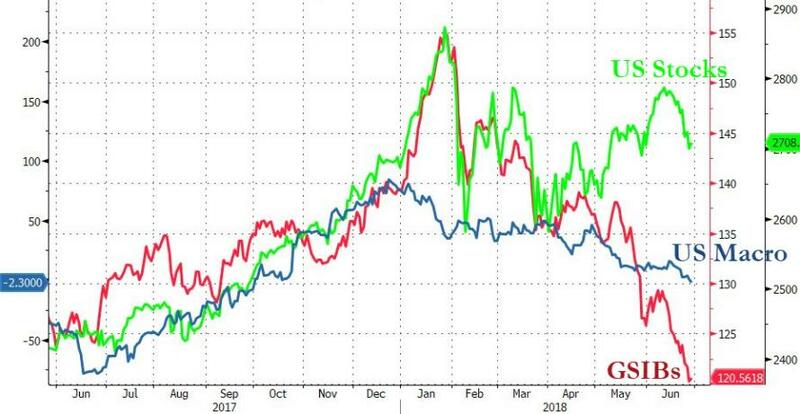 The world's biggest and most systemic banks are trading at 14-month lows and are in a bear market. The economic data are increasingly surprising to the downside. And yet stocks are a mere few percent off their highs.